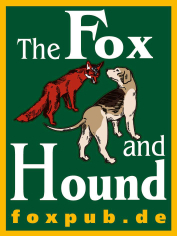 The Fox & Hound is nestled in the heart of the Westend, only a stones throw away from the main train station and Messe. We are located in the centre of the banking district, and stock over 35 sorts of whiskies. We also offer traditional English food….. anything from fish and chips to the best steak in town! Typical entertainment at the Hound includes Friday Night Jukebox (you choose the music! ), and most major sporting events. Our friendly staff will make sure that your every need is catered to.